[Blind Gossip] This talented New York actor could convincingly play anything from a cartoon animal to a gangster. He’s done over forty movies. Talk show hosts love him because he is good at telling stories. The man seriously never stops working. He may have to take a little time off, though, to deal with a personal issue! He is losing his hair. He has big bald patches and has been using that spray-on hair for over a year. No bueno! He’s been asking directors not to pull the camera in too close or you can really see it. He’s upset about it. Funny guy, but doesn’t find anything funny in going bald. [Optional] Best hair option for him? My guess, too – although with him being a firefighter and everything, I can’t imagine he’s that vain about his hair. My husband is a cop and vain about his hair. I think the description fits…John Leguizamo? The “cartoon animal to a gangster” part definitely fits the bill. Yes, John Leguizamo. He was co-hosting with Kelly Ripa yesterday. Has Nathan Lane made 40 movies? If so, I vote for him. Best hair option: If it’s minor, plugs. If not… just lose it, and wear toupees for certain roles. He’s a character actor, not a leading man. I think you got it!! He does bumblebee man on Simpsons, whose catch phrase is ” no es Bueno”? Oooh – I like this guess! Wilson now has more hair !!!! Hahahahahaha, you made my evening! Hanks is from California, not New York though. Don’t get a toupee. They are always obvious. Nathan Lane? I don’t care what kind of hair he has! Love him! Let it go, let it go. Oops, wrong movie. I wanna say John Leguizamo, he played Benny Blanco in Carlito’s way and he did voice over in the Ice Age movies. He’s also Colombian which might explain the “no bueno” title? Yep!!! Bingo with the clues. Also, he’s funny and constantly on talk shows, including co-hosting. Plus his current long hair has got to be for a reason. Alec Baldwin? NY actor, has played cartoon animal (Madagascar), has played gangsters in multiple movies, a funny guy, never stops working. He’s also had really good hair for a long time, so maybe it bothers him that it’s thinning? He goes for years without acting in anything. That’s not someone who never stops working. Actor: Bruce Willis?? No, he’s already bald. So I’m going with Hugh Jackman? John Leguizamo…. If you’ve seen him co-hosting with Kelly Ripa this week on LIVE, it’s hard to miss his hair issues, and all the other clues fit. While given the amount of hair he has left he’s a candidate for transplants, he has enough talent that were he to go the buzz cut route I don’t think it would hurt his career at all. 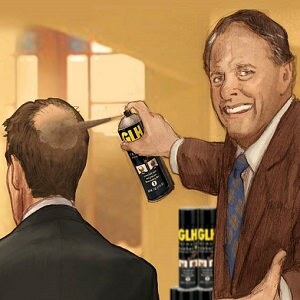 Get hair plugs. Good ones. Don’t get the cheap quickies like Donald Trump and appear as if you have cadaver hair. A crypt keeper weave. LOL. Only one i can think of is Alec putting the bald in Baldwin . It ain’t easy going bald but if it happens to you later in life consider yourself lucky. And they still make that spray on crap? This has to be Bobby De Niro!